WHAT: A bake sale for the “Air Force”? This Tax Day, the Peace Resource Center of San Diego is offering a “Bake Sale* For the Air Force?” in front of the Internal Revenue Serve to highlight our “half-baked” national skewed priorities. Part of the national call for an end to endless war and the anti-war Spring Actions 2018, we call for a stop to the US use of war as the solution. Our tax dollars should be used for building bridges – not bombs, walls and isolation. The recent tweets of terror from the White House underscore the bankrupt nature of our foreign policies. The Bake-Sale is a Teach-In on the ongoing US effort to “annex” Syria to remind us that US invasion of Syria has long been part of the destructive neo-con agenda for the Mid-East. We demand Congress do its job – hold the executive branch in check. No ban, no walls, no war on Syria. The Bake Sale will conclude with a San Diego Tax Day tradition – a local ceremony redirecting war taxes to community need. 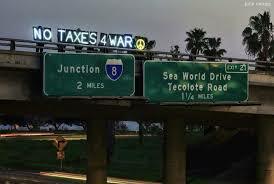 Local war tax redirector Anne Barron will redirect her war taxes to local community peace and justice organizations. “As a conscientious objector to state violence,” Anne explains her war tax redirection, “and I am choosing to value life over destruction with my taxes”. Part of the National War Tax Resistance Coordinating Committee, she participated in the national 2017 war tax redirection of over $20,000. Located within City Heights, the Peace Resource Center is a clearinghouse of peace and social justice resources, issues and activities. We promote networking among peace-related organizations, offer nonviolent alternatives in conflict resolution and carry on an expanding program of peace education in San Diego County. The Center is the local affiliate of the National War Tax Resistance Coordinating Committee (NWTRCC), which has coordinated national tax day actions since 1983. NWTRCC is a coalition of local, regional and national groups providing information and support to people who are conscientious objectors to paying taxes for war. NWTRCC partners with the Global Days of Action on Military Spending coordinated from Barcelona, Spain, to join protests of war spending in the U.S. with a demand for global disarmament and a shift in priorities to sustainable development. The full list of national tax day actions with more details and local contact information is at http://nwtrcc.org/programs-events/tax-day/tax-day-actions/. ← Previous Previous post: Justice 4 Stephon Clark? Community needs to be at the table of justice.